As the final chapter of the HPCSA enquiry into Prof Tim Noakes draws to a close tomorrow, we take a look at the evidence that each party presented before the Professional Conduct Committee. 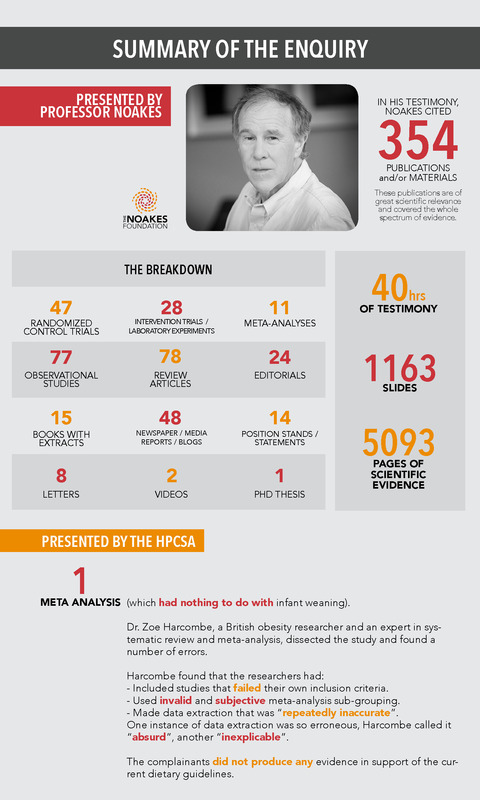 In his testimony, Prof Noakes cited 354 publications and/or materials. These publications are of great scientific relevance and covered the whole spectrum of evidence. In total Prof Noakes presented 40 hours of testimony including 1163 slides and 5093 pages of scientific evidence. Dr. Zoe Harcombe, a British obesity researcher and an expert in systematic review and meta-analysis, dissected the study used as evidence by the HPCSA and found a number of errors. Included studies that failed their own inclusion criteria. Used invalid and subjective meta-analysis sub-grouping. Harcombe called it “absurd”, another inexplicable”. The complainants did not produce any evidence in support of the current dietary guidelines. The difference, not only in the sheer volume but in the quality and credibility of the evidence, is overwhelming. Professor Noakes has truly done his homework and must be considered an expert in the field of nutrition, therefore qualified to make recommendations and suggestions to those who ask.